My good friend Ann brought these over a few days ago and they were incredible! I'm not a big oreo fan but I was sold on these cupcakes. I was telling one of my favorite NICU nurses Pam about these and she seemed interested so I decided to whip up a batch for my NICU nurses. 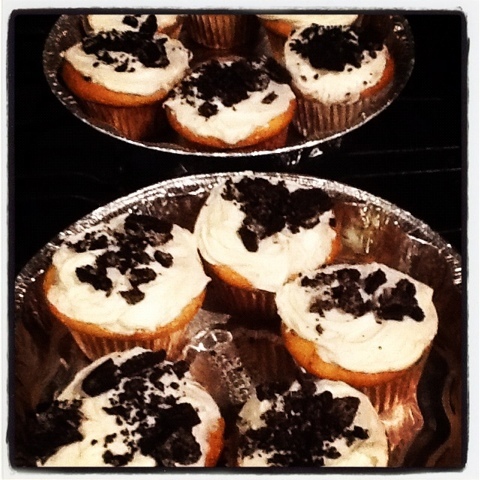 The yummy thing about the cupcakes is that they are lined on the bottom with a half of an oreo so it has a crunch to it. Here is the recipe. If you are an oreo lover I highly suggest you give these a try, they are just too yummy. I love recipes that look like you put a lot of time into it and you didn't, it's a win win!